Join the Beach Chamber Today! The Panama City Beach Chamber of Commerce will host its IdeaCamp on Wednesday, November 29, from 5:30 – 7:30 PM, at The Pour coffee shop, located at 12902 Front Beach Road. 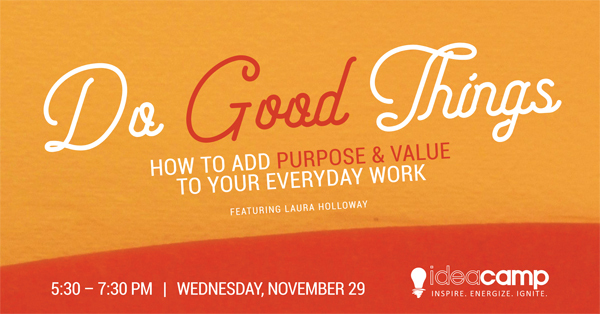 Guest Speaker Laura Holloway will speak on the topic, “Do Good Things: How to Add Purpose & Value to Your Everyday Work,” and Dave Balmer will facilitate an open-mic, “think tank” session in which guests will have the opportunity to share their takeaways from 2017 IdeaCamps. Laura Holloway is the Founder & Chief of The Storyteller Agency, an organization that helps businesses rethink marketing and consider their message as an ongoing narrative and conversation with their audience. She is also the Co-Founder of SheWolf Collaborative, a collective that promotes and inspires creative, entrepreneurial women. Laura is frequently asked to speak at conferences, meetings, and workshops about the value of content marketing for business, but, relevant to this IdeaCamp, she also has a huge passion about helping people find purpose and value in their everyday work, no matter which line of work they are in. IdeaCamp is a laid-back networking event for the movers and shakers, the podcast-listeners, the goal-setters, the inspiration-seekers, and everything in between. Attendees will get the opportunity to hear people share their own wisdom, stories, and tips for business and life success. Light hors-d’oeuvres and The Pour coffee will be provided. IdeaCamp is FREE for Beach Chamber members and $10 for non-members. This IdeaCamp is presented by Southwest Airlines and sponsored by Beachy Beach Real Estate, Panama City Toyota, and ServPro of Bay County. To RSVP, click here.